Educate Together’s 2014 Ethos Conference will take place on Saturday November 22nd in the National College of Ireland, Mayor Street, Dublin 1. This conference is the highlight of the school year! With attendances of well over 100, it’s the place to be for teachers, board members, parents and principals. It’s all about interrogating current issues, sharing ideas and best practice and networking in the very best sense. More parents than ever want to send their children to an Educate Together school. But with reduced resources (the government provides just 15% of funding for new primary schools), Educate Together is struggling to keep up with that growing demand. Educate Together has made a national appeal for financial help to continue its work. Some of you are aware that a wall shared between Balbriggan ETNS and a local housing estate was defaced with appalling racist graffiti last week. This is the third occasion on which this has happened. The matter is being dealt with by the Gardaí. As an Educate Together school we stand against racism in all its forms. As a friend of Balbriggan ETNS, we support them in their stand against racism. 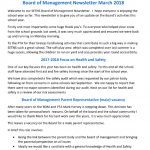 The Board of Management recently ratified a new Safety, Health & Welfare Policy. A copy of the policy is available on the school website www.swordseducatetogether.ie and is also displayed on the school notice board. At a time when water is very much in the news, our drinking water saga looks like it might finally be drawing to a close following the installation of new drinking water taps. We await final confirmation, but we look forward to the ‘do not drink the water’ restriction being lifted very shortly. Karl has well and truly settled in to his new role as Principal. His enthusiasm for the job is evident for all to see. We are confident he will build on the good work of those who went before him and also make his own mark as Principal of SETNS. 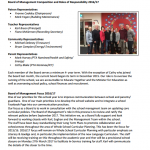 We recently filled the permanent teaching post created by the departure of Fiona and Karl’s promotion. We are delighted to welcome Orla O’Donovan onto our permanent staff. We are also delighted to welcome Emma Plunkett and Liz Kinsella who are taking up temporary teaching posts in the school. We have already commenced the consultation process for the filling of Karl’s previous post of Deputy Principal. We hope to be in a position shortly to advertise the post. The post is confined to teaching staff in the school. All going well, we will have a Deputy Principal in place before the end of this school term. Congratulations to all those students who were elected to the Student Council. I look forward to meeting with them to discuss issues of mutual interest! Well done too to those elected to the Green Team. We are sure it won’t be long before we unfurl our fourth green flag! Congratulations to Audrey Halpin who takes up the reins at PTA Chairperson for the coming year. A big thank you also, to those who commit their time and energy to ensure that the PTA continues to be a vibrant component in school life. We look forward to working with you and the newly elected fundraising committee this year. A special word of appreciation for last year’s Chairperson, Priya Krishnan Raj for her excellent work over the year. What’s happening in Swords Educate Together? The new Board of Management is made up of representatives from across the school community. Parent Representatives were elected from the PTA Annual General Meeting and the Teacher Representative was nominated by teachers in the school. This year The Board’s aim is to improve on communications and,with the help of the PTA,a more focused fundraising strategy. 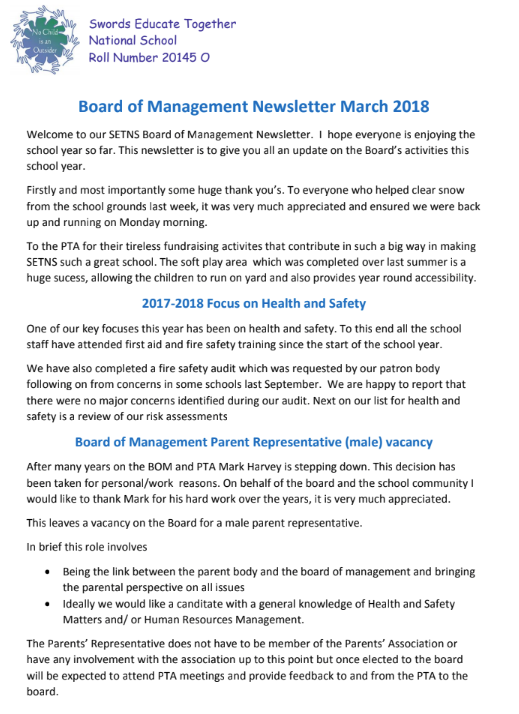 Work is ongoing to make our website more current and informative;there will be more regular newsletters keeping you briefed on what’s happening and there will be an open meeting held at the end of the school year to update the school community on the school’s progress to date and to give parents an opportunity to air views and ideas. Though it is a delight to be finally in our beautiful new school,there is a long snag list which grows longer as teachers and students settle in to their new home. Many of the snags are minor but still must be resolved and this does take time and much red tape so please bear with us. Mark Fagan and Fiona are working tirelessly with the various contractors,the Department of Education and Skills and Fingal County Council and their progress,behind the scenes,is focused and determined. One of our more serious issues is the fact that we still do not have drinking water. Every effort is being made to resolve this most basic requirement but we will abide by the Council’s directive;as always the priority must be the health and safety of children and staff. Please continue to provide your child with additional drinking water until we get the ‘all clear’ from Fingal County Council. There are still grave concerns about traffic management in the vicinity of the school. The Board has written to Fingal County Council,Road Safety Section on the 9th December,16th January and again on the 20th February in relation to the provision of a traffic warden. To date we have not received even the courtesy of an acknowledgement. We will continue to pursue this issue at board level but please do raise this issue with your own residents associations and with your local councillors if the opportunity arises. A number of issues in relation to the playground are currently being clarified with the supplier. In the meantime access to the playground equipment is still restricted. This is,of course,very hard on our infants and frustrating for us all but we ask for your patience;safety must be our top priority. Our wonderful Deputy Principal Mary Lynch retires at the end of this month. It was a shock to the Board of Management when Mary informed us of her decision – we all thought she was much too young to retire! Mary has been ever present in the school since she started in September 2001. She has been an excellent Deputy Principal and she will be greatly missed by us all. We understand she has many plans for her retirement and on behalf of the whole school community we wish her luck,good health and a long and happy retirement. A competitive and lengthy process has recently concluded to identify Mary Lynch’s successor as Deputy Principal and the Board hopes to be in a position to make an announcement shortly in relation to this. It is a huge role to take on with much involved in terms of both time and responsibility and it was heartening to see the number of teachers ready to step up to the plate. The dedication of our teachers is humbling and always hugely appreciated by the board;we are lucky to have such a strong and committed team. Demand for places in the school still exceeds the number of places available. Both Junior Infants classes for the new school year have been filled and a number of children remain on the waiting list. It is important for parents of children in the school with younger siblings to note that the school’s enrolment policy is ‘first come;first served’. Please enrol younger siblings at the earliest opportunity. 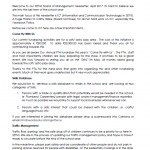 A revised Child Protection Policy has recently been agreed by the Board of Management. This was necessary because of changes in legislation and to reflect the recently published Children First – National Guidance for the Protection and Welfare of Children 2011 issued by the Department of Children and Youth Affairs. A copy of the revised policy is available on the school website. Alternatively you may pick up a copy from Catriona at the school office. It has become very apparent as we deal with the ongoing problems that come with our new building and anticipate the general maintenance involved in running such a large operation,smoothly and successfully,there will be occasions when we will need support in various areas. If you are involved in any business that you think may be of use to the school and would like to be invited to tender a quote if or when these jobs arise,please send your full details to the Chairperson,Elaine Birmingham. Elaine Bermingham,Chairperson,Patron Nominee;Fiona Rushe,Principal; Karl Breen,Recording Secretary,Teacher Nominee; Mark Fagan,Facilities and Shared Facility Executive,Patron Nominee. Dave McLoughlin,Health &Safety &PTA,Parent Nominee;Niamh Kerrigan,Fundraising and PTA,Parent Nominee; Michael Delaney,Finance,Community Nominee;Colette Caddle,Communications,Community Nominee.